Usually I start a bunch of new projects in the spring and fall, something about the change of season, I guess. This year, I was obsessed with Brinton Hall, and I stayed focused on that right through the fall, pretty much. But now, I cannot stand it any more. My Flamingos en Provence is on hold this week, because I am worried about my white fabrics, and I want to see more before I commit with them. There are several projects that I've been planning for as much as a year, and I've decided that this week I'm going to start every project that has it's own pile of fabric already. I think there are three for now, and one more for January. It seems counterintuitive, but I think they will be less distracting once they are started. Two of them are Bonnie Hunter designs. 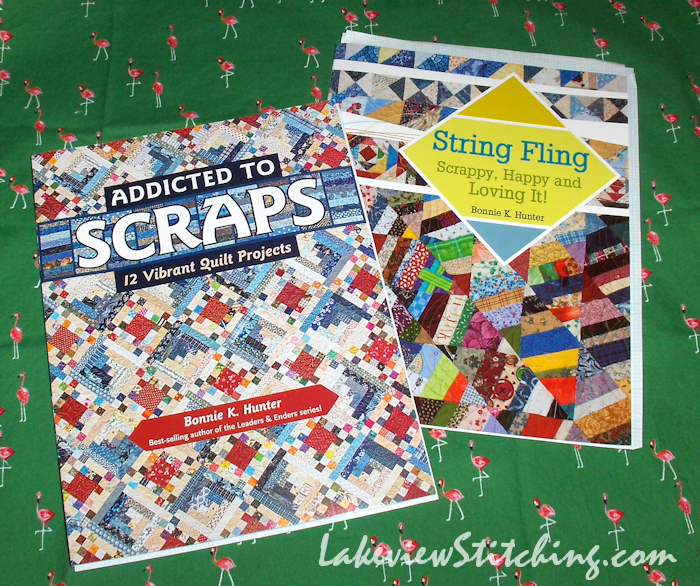 Today's new project is from Bonnie's latest book, Addicted to Scraps (Kansas City Star Quilts, 2016). I bought the book for "Garden Party," which I think is a design that people will still be making in 50 years. 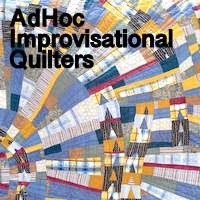 And I really like the cover quilt, "Idaho Square Dance." But, the one that completely hypnotized me was "Wild & Goosey:"
I think my first thought was something like "jeepers, no way!" But then the next day I had to read how it was made. And the day after that I wondered about a different colour scheme. And then the graph paper came out and that was pretty much it. In her introduction Bonnie tells a funny story about her report card from fourth grade, where the teacher wrote, "Bonnie is bright and cheerful, with much potential if only we could contain that extra energy and get her to slow down and focus..." I bet she was the sweetest kid! Quilt guilds are full of high energy people who probably had similar comments in school. 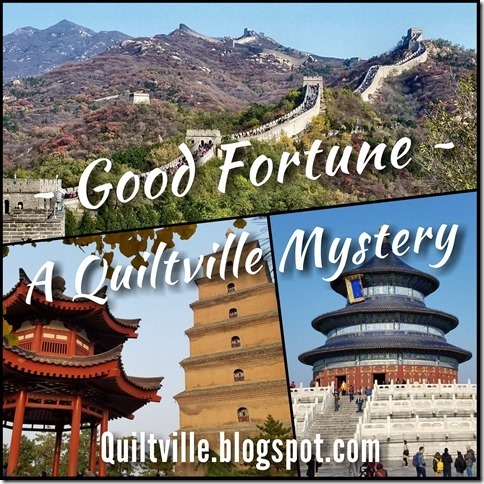 I know that I stayed focused only as long as the work was sufficiently challenging, which is quite possibly why I am always expanding my projects! But I think Bonnie's genius is that she makes these really outrageous, densely stitched quilts seem both manageable and reasonable. And once you've done one yourself, you get hooked. ...was a strip of the dreaded banana fabric!! I really thought that was all gone. 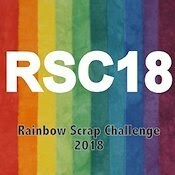 But this time I have finally put a good dent in my scrap box. Maybe 2/3 of it is now ironed and rough cut for foundation paper piecing. Maybe 3/4! 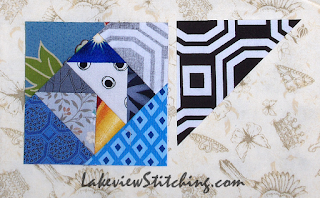 Bonnie used a solid yellow in the flying geese sashing strips. I thought it would look good in red, with light-coloured geese instead. Then if the geese in the sashing were light, it looked best if the diagonal geese in the squares were also light. 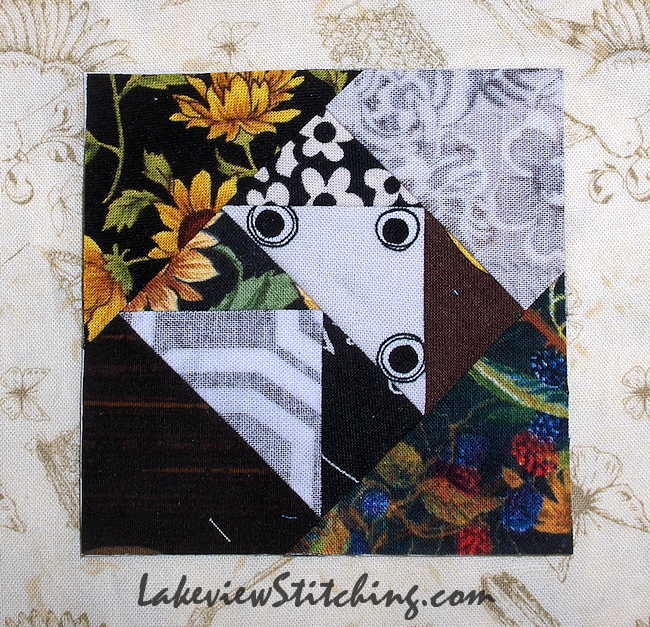 Then one thing led to another and I redesigned the piecing of the squares too. Mainly, I had to do it because I changed the placement of the darks and lights, but also, mine will be less sewing. Some of the blocks developed their own colour schemes. I love this one! Not my usual colours at all. 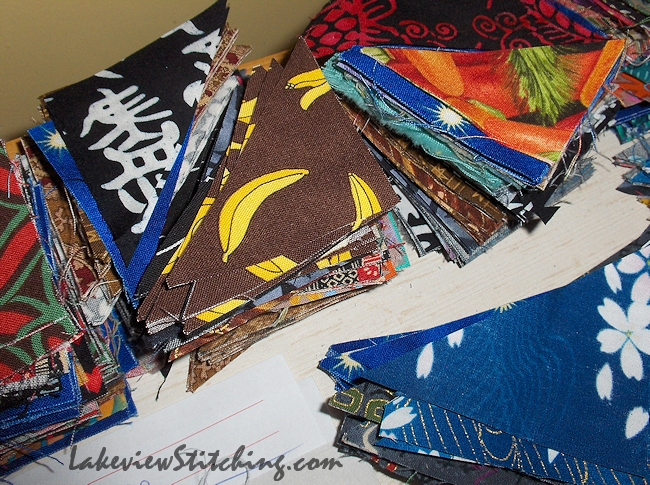 There weren't a lot of light fabrics in my scrap box, so in a few places I used the back of the fabric instead. The high contrast black and white fabric on the right is a nice soft grey and white in the block on the left. The purple gingham in the block above was also used backwards. ...and this perfectly placed daisy. Couldn't do that on purpose if I tried! Overall, the whole set turned out way, way better than I expected. They look almost like faceted gems to me. 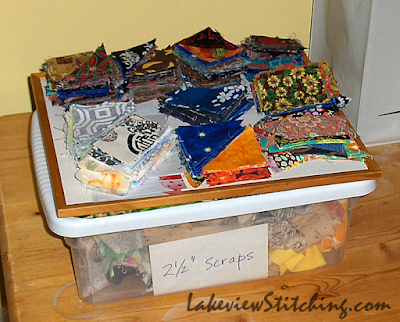 It's much richer than I expected for such a hodgepodge of mostly ratty fabrics. Now I am less sure about the red sashing. Maybe there is still a better choice out there? A slate blue, maybe? A warm caramel? No matter what, I'll probably have to buy something, so I'll look around a bit. One week 'til Boxing Day! I was looking at this book at the quilt shop saturday and that is the exact same quilt that caught my eye. Now I'm wishing I had bought the book. Oh, my! It's looking good already. Save the color of sashing decision for later and keep on making the fun blocks until the right color grabs you and says "insert here". 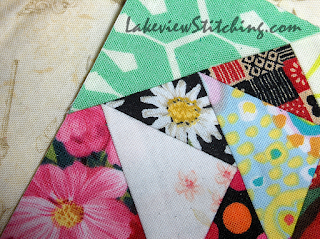 Gosh...using up scraps and some of them are novelties to boot...what could be more delightful? This is such a lovely pattern. It reminds me of Odd Fellows block, another I've always wanted to do. Good start. Happy Boxing Day. You have such a good eye! These are just great - as you say, gems. I'd have to try fabric for the sashing- I'm no good at all at imagining what will go. The red seems unlikely, but maybe worth a look. I've no doubt you'll get it spot on! Thanks, Jillian! When I looked at it in the dark last night, I was leaning towards the dull blue background. But now that I see it in sunlight again, the red feels right. As you say, I will have to try each one before I make a final decision. Probably either one would be good. But, the blue is already in my stash! 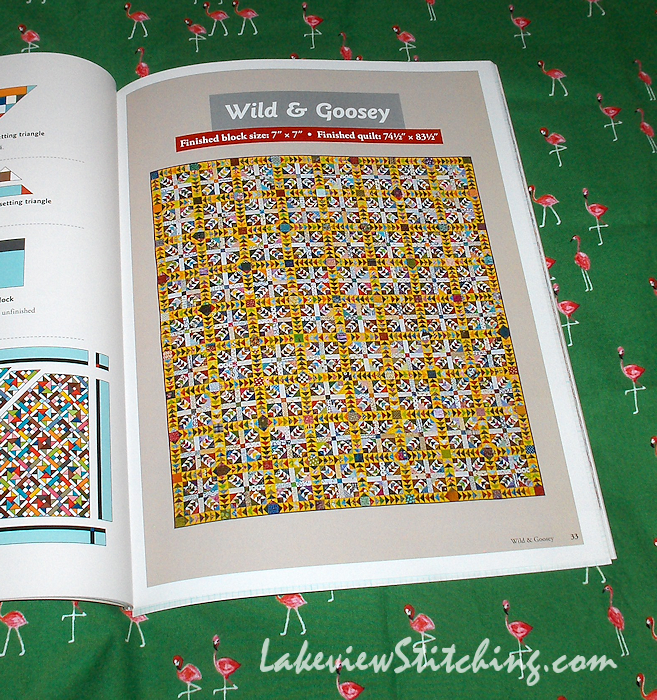 Wild and Goosey has been on my to make list ever since I saw that block in a quilt magazine. . .I'm thinking QuiltMaker. I saved the pattern; but, I'm not the "starter" you are. I love your blocks. 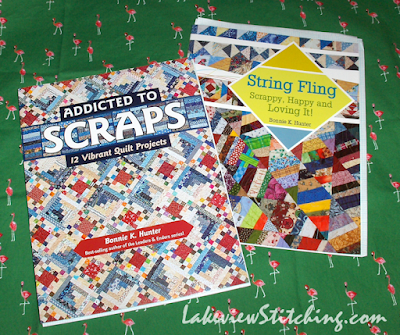 How fun is it to see those saved scraps go into a project. . .the older the scraps, the better it is! Thanks, Terry! In project management training we learned that some people are starters, and some people are finishers, and you want them both on your team. 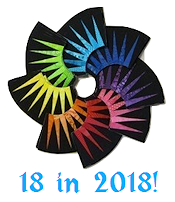 As quilters, we are usually teams of one! I am going to make an effort to start enjoying the finish more. 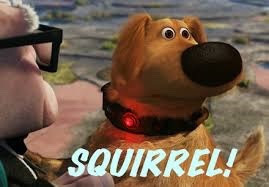 Just as soon as I get these off my mind! I think I have some of that banana fabric around too--lol! I also love Wild and Goosey, but I doubt that I could ever make myself do all those geese. I think yours is going to be awesome--Wilder and Goosey!! I love your Logic. Start all the quilts you have been obsessing about and see where they take you. 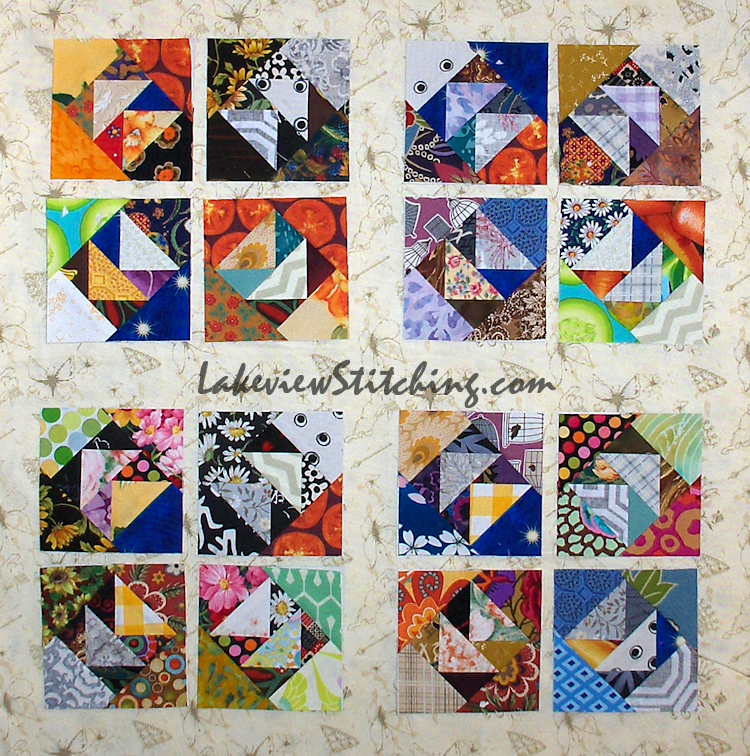 I have several patterns and project boxes sitting waiting for a start. Oh what fun! I'm happy to hear that I am not the only one who uses the backside of the fabric when ever needed. 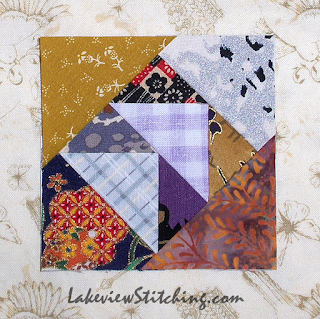 This is one beautiful scrap quilt! My grandfather is from Nova Scotia and Boxing Day is one of our favorite holidays! Happy Boxing Day and New Year to you!